Oh yes, we do. I guess that’s what makes us good at procrastination coaching. I made a second video, and I put it on the homepage of my site. I didn’t think it was good enough yet, but as a recovering perfectionist I decided to publish it anyway. In rational effectiveness training this is called a shame attacking exercise. To do something you expect to feel foolish or embarrassed about. And shame I did get. Which I turned into another shame exercise, by writing a blog about it. It’s my most well read post. Yet another shame exercise 😉 What the heck, I’ll post that one too. I’ve learned that having more than 3 excuses for the same item is definitely an indication of #procrastination. Luckily, I get help. Rescue came in the form of Holly Sugrues 30 day video challenge: From zero to video hero. I regretted it as soon as I signed up for it, because I was pretty sure I would really participate. Ouch. More videos. More scary things. Getting over my fear of talking to a camera. Learning how to edit videos, even though I think that’s a hassle. Thanks Holly, I am having alot of fun indeed. And I’m very impressed with the progress everybody is making. It’s going fast! Oh gosh, I know what you’re saying! Every time I edit one of my videos I cringe at the shadow behind me (because it was too dark to film without a lamp), the fact that you can hear noise in the background, my own stumbling… ugh! But I made a commitment and I’m sticking to it. There are better videos and worse videos, but this is ME and I’m going to stop hiding myself from the world. Good luck with this journey! Such a powerful statement: “this is ME and I’m going to stop hiding myself from the world”. Many people have said that they connect mostly to the imperfect videos, because they are really human. Great that you’re not letting yourself be held back! Thanks Siedah, happy New Year to you too! At least your technology wasn’t against you trying to make a video. The one time I tried to to a short video review my computer locked up and made horrible sound distortions while I was trying to record. Ah, Cassi, that’s so frustrating! I can totally recommend the video challenge I’m participating in. It’s helping people a lot. My excuses have mostly been about technical challenges, with time and my appearance also causing delays. I actually wrote the scripts for some good, short videos about family mediation two months ago, but I don’t have any videos to post yet. Maybe you and I can encourage each other. See you’re already using the videos for your blog, good move! That quote made me smile 🙂 Very apt for procrastinators! Thanks for visiting Helene, I’m looking forward to your next videos. Congratulations on making the leap to video. And also for jumping in with both feet! 🙂 One sure way to overcome procrastination and fear is to join an accountability group that holds you to a higher standard and takes away all your excuses to just doing it. Thanks for talking about this subject. I think a lot of people are intimidated by video and I believe it’s such a powerful way to connect in a very personal and unique way. Gosh I can so relate! 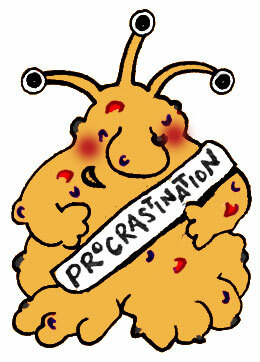 I am the worst procrastinator all the time! Not sometimes – all the time!!! I’m with you though, if I can find some group project or new platform for doing whatever I need to do, it helps me do it. I guess it makes it more fun or interesting or something.